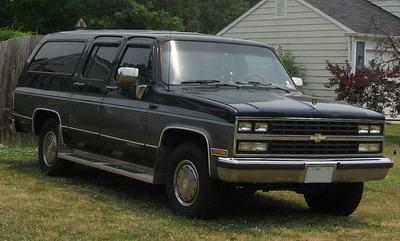 I am interested in converting a 1990 Chevy Scottsdale Suburban to electric. What type of electric motor or motors or in wheel motors would I want to use? Would an A/C motor or a DC motor be better for the following: I would like to be able to climb mountain roads. Would like to reach speeds of 80 mph; wouldn't really have a use for anything over 120 mph. Would like to be able to tow as well. If you could get me pointed in the right direction I would appreciate it. Can I just apologize for starting off with being discouraging? A 1990 Suburban is not the project I would choose for my first conversion. Too old, too heavy, too...automatic, usually. That said? If this is your joy, then it seems like the most reasonable way to tackle it might be to get a Tesla Model S drive unit. They sell these at EV West for about 12k, and it includes the whole enchilada. This is a 3 phase AC induction motor, which is pretty common in electric cars and has a lot of torque for hill climbing and towing. It sounds like you don't want to keep the transmission? (Which makes sense, if it's automatic.) All the more reason to use the Tesla drive unit. In-wheel motors are not available (yet) for sale to the public, as far as I know. Did you know you can get an entire used Nissan LEAF, battery pack and motor and all, for the price of that drive unit alone? For my money, I think that is what I'd choose. Hope this helps. Best of luck with your project!